I’ve been getting this weird error in the output for my shield, that I have no idea how to fix. It says "The current identity (2) cannot MakeJoints (lacking permission 1). Does anyone know what I am doing wrong? This is where the error is located. You set the parent of the shield to workspace, and then you call :MakeJoints() on the shield’s parent. So at the top I should change “local shield = script.Parent.Parent” to “local shield = workspace.Parent”? You should figure out what you want it to do, which I doubt is call :MakeJoints() on workspace (espcially since that throws an error). Figure out what you want to call it on. What I’m trying to get the shield to do is spawn on my left arm, by pressing the key “Q”. Then by pressing the key “E” it should raise the shield. After you check the equip flag, you dynamically build the shield’s welds (all welded to the handle). In my opinion, I would have this done already with the model, since you also introduced a few bugs. Unequipping and re-equiping would generate the welds again. Next, you parent the shield to workspace, my assumption is it should be the character; would you want a shield instance “floating” in the workspace? 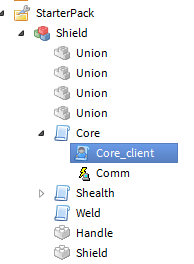 Then you call MakeJoints on the shield’s parent (workspace as of now). Here’s the definition of :MakeJoints() from the wiki. Description: Goes through all parts contained in the Model. If any part’s side has a SurfaceType that can make a joint it will create a joint. So I assume that’s not at all what you want, you can remove that line. Finally, you create a weld for the hand. As far as I can tell, that’s correct. Though, using instance.new(name, parent) and supplying the parent is bad practice; you should initalize all the properties before setting the parent. Also you set the C1 to the default value. Firstly, change this to Instance.new(“Weld”) or Instance.new(“Motor6D”) without the second argument. Set the parent of the weld last, after you set all the CFrames. Secondly, either Part0 or Part1 should be getting set to i, no? This loop probably isn’t welding the handle to itself, because it’s spelled with capital H in one place and lowercase in the other, but even so, I doubt welding the handle to itself repeatedly is what you want anyways. Lastly, I don’t think your C0 and C1 settings are what you want either. It might look right, but if it were a Motor6D and you set an angle on it, you’d get some weird results. You don’t normally want these CFrames in world space you want them to be in the reference frames of Part0 and Part1.